These bright yellow anthers form a bearded iris in my yard contain pollen sacs. 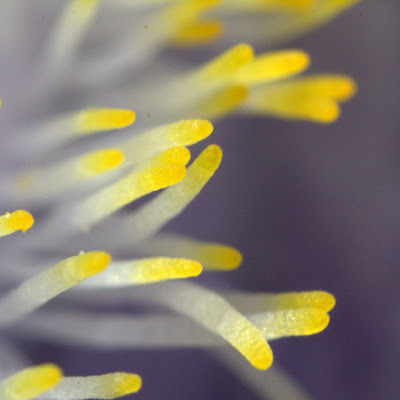 The sacs release pollen on to the outside of the anthers that brush against insects on entering the flowers. This is a 4x macro shot made with my Canon 40D at 1/125 of a second at f/9.0, ISO 400 using a Canon MP-E 65mm f/2.8 lens.